Click here for more recipe ideas! 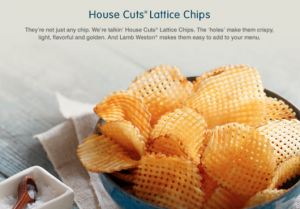 Prepare Chips ahead of time and reserve until serving. 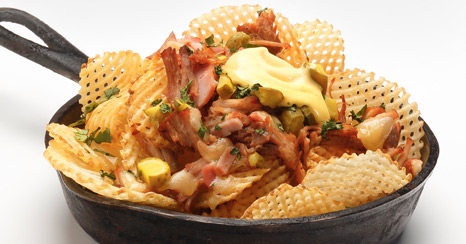 Take sliced ham and pork and chop roughly, sprinkle atop chips, do the same with the Swiss cheese and flash under broiler until cheese melts. Drizzle mustard sauce and top with pickles and cilantro. 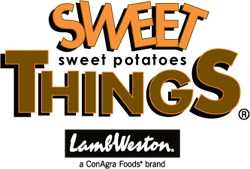 Send your customers on a flavor vacation with Lamb Weston® Seashore-Style™ Fries. Seashore Fries are a thick-cut fry that are seasoned with sea salt, cracked black pepper and garlic. The skin-on appearance gives the fries an authentic, hand-cut look customers can’t resist. This distinct flavor is no longer just for hungry beachgoers but for fry lovers from coast to coast. The key flavors in Seashore Fries—sea salt, cracked black pepper and garlic—are on trend and growing on menus nationwide. Sea Salt is one of the top trends in fries whether served as an appetizer or à la carte, with +137% growth from 2009 to 2013. Seashore Fries are perfect for any operation. 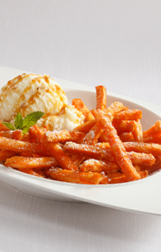 With the most variety of sweet, savory and crowd-pleaser flavor profiles, all with unbeatable crispness, Sweet Things® Sweet Potato Fries are the perfect platform for creating memorable appetizer presentations. 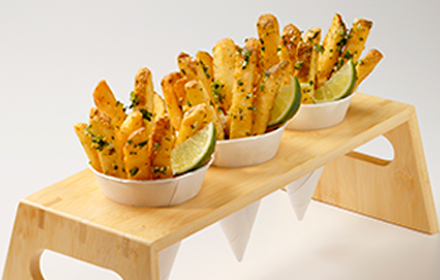 Serving them tossed, sauced or with a signature dip will add distinction to your menu and generate customer interest. Use these recipes as a guide to help you sweeten up your menu and profits. Fry Sweet potato fries and season with Cinnamon sugar. Top with Ice-cream, Chocolate and Carmel sauces, whipped cream and cherries.